The elevation of spontaneity and emotion over planning and execution explains why leaders waste themselves on non-essentials. Fall into the spontaneity trap and end up chasing triviality. Corrective feedback goes wrong, if at all. Direction replaces development and coaching. Correction takes the place of thanking. Respond to the person whose hair’s on fire, but don’t neglect weighty matters like culture building, for example. Trusting in spontaneity makes you inconsistent and unstable. Make Wednesday ‘Core Value Day’. Schedule a specific behavior that expresses one of your core values. Hopefully you’re already living your values, but it’s useful to bring them top of mind. Call and thank customers for their business, for example. Where are the energy drains in our organization? What would we like to do about that? How might we make it easier to achieve results? Monday at 10:00 a.m. : What’s important for you to get done this week? Tuesday at 11:30 a.m.: Notice good stuff. Schedule positivity or negativity will dominate. Wednesday at 9:00 a.m.: How can we get the ball rolling now? Perfect as you go, not before you go. Thursday at 1:30 p.m.: What are you glad you’ve done so far this week? Friday at 4:00 p.m: What are your plans for the weekend? What important matters should all leaders put on their schedules? What would you put on your focused walkabouts? 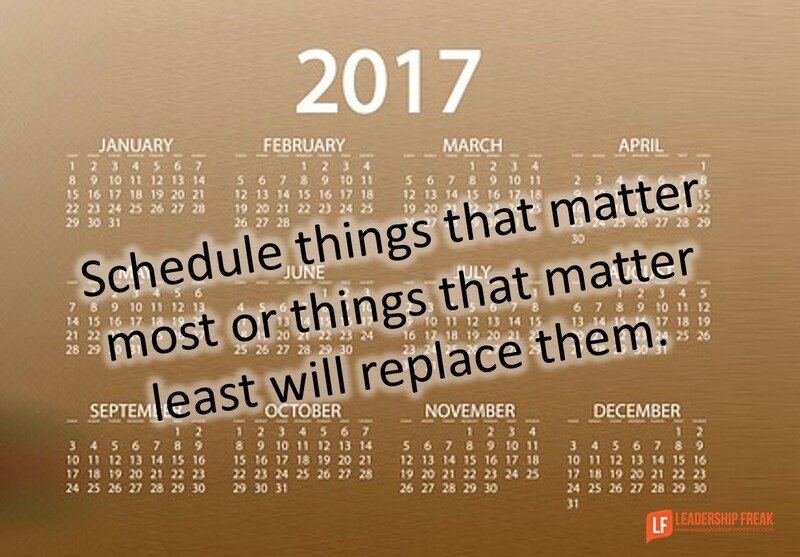 What important matters should all leaders put on their schedules? Depending on your business customers come first, what matters for me is how we treat them and accomplish their projects. To schedule can be a complex task because “everyone wants it now” often times without planning! Priorities become the guiding light, are they out of service? What do we need to fix it? How quick can we mobilize? Are we prepared to go the “extra mile” to work after hours? You/we need to “be prepared” at all times for your customers. Time seems to be a factor in everything we do, the word “magician” jumps out a lot, we “can do everything with nothing” in a fairy tale world. What would you put on your focused walkabouts? For me is to verify components available to serve our customers, accepting the fact we can’t stock everything, but have a checklist to someone who does. Develop a system of reliable partners to maintain our client bases services so we all can function. You remind me that finding practical expressions of our commitment to serve customers is necessary. It’s odd, but we can neglect the people we serve, even while trying to serve them. Dan, for sure, resources under-utilized is a key component, align with your best providers, determine the factors to get each party on same page, and “we can make it happen”! The joys of being a Servant! I can tell you I truly enjoy helping our customers, without challenges to keep us on the “A” game, we just flutter aimlessly.. I am AWFUL at sorting out things, pretty much doing what I WANT to do much more than doing what i NEED to do, but implementing big changes at this point is going to be really difficult. The ideas and suggestions and frameworks is excellent. For those leading OTHER people, improving alignment and focus and setting attainable goals, providing excellent performance-related feedback and recognition are what will help drive them forward to attain your desired outcomes. I remain a big believer in MBWA and being present in a workplace offers all sorts of positive possibilities with little real downside. But pushing paper is a corporate requirement. And a good meeting topic can be around, “What can we STOP doing that wastes our time.” Lots of good round wheel ideas get mentioned and people can select from considered alternatives that they might not be aware of. Have FUN out there, too! Happy New Year.